What is happening right now in climate policy, smart financial investment strategy redesign, and energy innovation, is as big a revolution as the world has known in its history. In the last year, we have seen the world move from an aim to avoid global temperature rise of 2ºC, to the more ambitious 1.5ºC; we have seen breakthrough technologies in household clean energy storage, and hyperlocal distributed solar power generation. And this week, Saudi Arabia’s oil minister announced a vision that includes the full phase out of oil consumption by 2040 or 2050, with a profitable shift to solar energy. This week, the International Monetary Fund released a working paper that found the total cost of post-tax subsidies to the fossil fuel sector will reach $5.3 trillion in 2015, or 6% of global GDP. In developing countries, costs are reaching 18% or higher of GDP. The destructive fallout that flows from these expenditures mean they also impose a hidden drag on the economy, including on the wellbeing of individuals, communities, and societies. We are now beyond the point of debating the wisdom or profitability of a transition away from high-risk, high-carbon energy technologies. 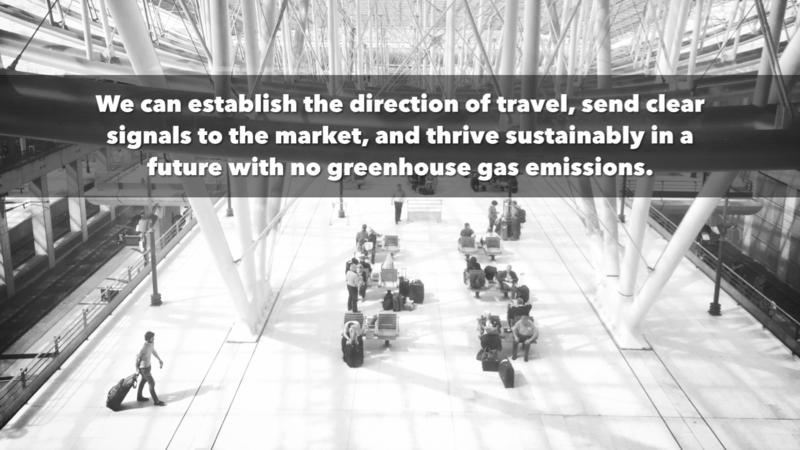 We are now firmly in the planning phase, where we talk openly about which strategy is the best for getting to the sustainable, low-carbon economy we are going to eventually live in. 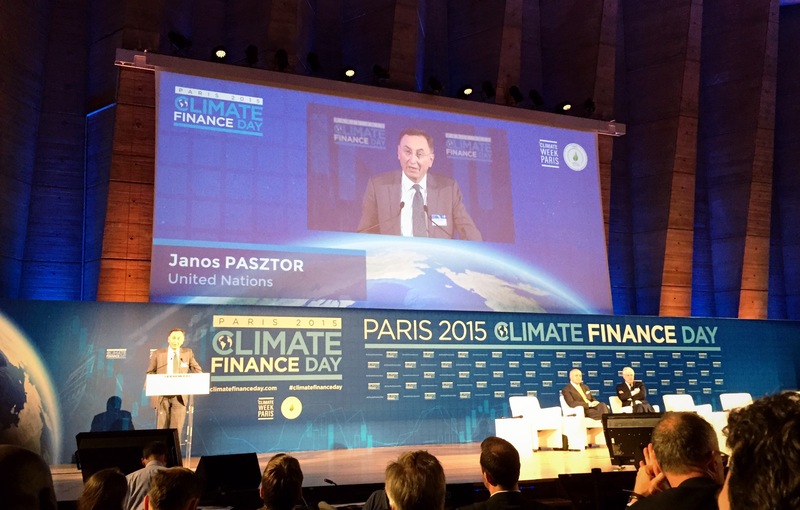 At the Climate Finance Day 2015, János Pásztor, Assistant UN Secretary General for Climate, described the events of the last two days as having achieved “multiple tectonic shifts”. During the Business Climate talks and the Climate Finance Day, there have been genuine breakthroughs in terms of increasing ambition for low-carbon investment, decarbonization of portfolios, and strategies for serious, sustainable, locally managed low-carbon development. AXA pledged on Friday to eliminate all remaining “coal exposure” across all of its portfolios. The tide is turning on financial sector investment priorities. We have seen major new commitments for investment in clean, renewable resources, from the world’s leading banks and financial institutions. There is now a Portfolio Decarbonization Coalition, and this year’s negotiating text for the global climate accord includes the ambitious goal of “Full Decarbonization by 2050”—that’s the total elimination of combustible fuels from energy production, in just 35 years. Christiana Figueres, executive secretary of the UN Climate Change division, said we need to redefine the overall aim of climate finance. Instead of narrow commitments to fund specific projects, she said, the aim should be a world in which no part of the global financial sector generates climate damage. All finance should be climate smart. Status-quo thinking is the enemy of the possible. Tech transfer and major financial support are needed. Policies must align with this objective. Meanwhile, there is an ongoing effort to build the Carbon Pricing Leadership Coalition—a collaboration between governments, multilateral bodies, business coalitions, policy experts, and civil society organizations—to craft and promote standards that will allow each nation to find its way to the optimal locally grounded approach to carbon pricing. The CPLC could also be a forum for determining how we harmonize distinct pricing methodologies across borders, to achieve a collaborative framework ensuring little to no leakage of emissions from one market to another. A year ago, it seemed like we were on track to miss the target of staying “within a 2ºC scenario”, with little hope for global net zero emissions by 2050. Now, after what ASG Pásztor termed “multiple tectonic shifts”, we are heading for a much more ambitious and collaborative future economy. The Lima Call for Climate Action added the more ambitious 1.5ºC target for global average warming above pre-industrial levels. The Lima Elements Annex, now the Geneva (and soon Bonn) text, includes Full Decarbonization by 2050 as a goal. Bolstering the vision inherent in that target, the last year has seen a wave of breakthrough innovations: more affordable nano-scale solar PV particles, edge-capture PV touchscreen glass, new wind project development in nearly every major economy, microgrid innovation in India and across the world, and Tesla’s new PowerWall home storage unit, to make sure overnight solar power becomes a reality. We are living in a different world, and so much more has now become possible. When Ali al-Naimi, Saudi Arabia’s oil minister, acknowledged we will not need fossil fuels, possibly as early as 2040, it made a splash, but did not shock the world. It fits, in fact, into the pattern of analysis we are seeing from all corners. The work of the Sustainable Development Solutions Network (UN-SDSN) to lay out Deep Decarbonization Pathways has shown that full decarbonization by 2050 is within reach. Just using technologies already in existence, it is possible to get close, with no economic drag; as revolutionary breakthroughs in business, finance, policy and technology come through, the date will inevitably be moved forward. Infrastructure must be designed to operate within and around the natural systems that support human life and promote the security and prosperity of free societies. Human wellbeing depends on a climate resilient built environment. We are redesigning the global economy in the way Buckminster Fuller was hoping to see: so that energy inputs no longer outpace energy outputs, and our everyday practices no longer degrade the natural systems on which life itself depends. The targets already set in the early INDCs announced so far can be made more ambitious, if we bring everyone into this new climate of escalating ambition. At the stakeholder launch for the 2015 Sustainable Innovation Forum, to be hosted by Climate Action in Paris during the COP21, Ambassador Pierre Henri Guignard—Secretary General of the COP21 planning team—said France aims “to give stakeholders and delegates the chance to work together” for a better outcome. He added that businesses, young people, and civil society in general, are all necessary parts of a real solution. At the close of the Climate Finance Day, Laurent Fabius, Foreign Minister of France, explained that in building up to COP21, “We are working to make the decarbonized society a definitive fact.” More than 6.5 million companies have committed to make low-carbon development a priority. The Green Climate Fund has reached the threshold required to start operations. We are on track for the most transformational year of technical, political, and investment breakthroughs, we have seen to date. The Paris Accord should set us on a course to achieve a 50% reduction in global emissions by 2025—a pace that will serve to push an unprecedented wave of new investment through the global economy—with full decarbonization no later than 2050. We now know: that ambitious target can be the worst-case scenario permitted by our politics and by our investment priorities, and we can escalate ambition as we gain efficiency—both carbon efficiency and generative economic value-building efficiency—in all economic sectors. Join the Citizens’ Climate Engagement Network, and have your say in how we get this done.